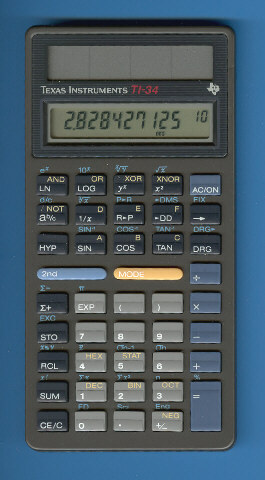 This TI-34 with the blue function keys looks more serious compared to the original TI-34 introduced two years earlier. Production of the TI-34 was later shifted to Malaysia. You could recognize these calculators easily due to the smaller solar cells. Compare it here. Dismantling the second version of the TI-34, still manufactured by Inventec Corporation in Taiwan reveals a more or less unchanged design. Another few years later the TI-34 got a more stylish housing. © Joerg Woerner, February 23, 2002. No reprints without written permission.